Our practice Math worksheets show the four operations and offer space to practice equations three times each. We have colorful fraction worksheets, cursive writing ABC worksheets, and Spelling worksheets, Reading worksheets, printable birthday cards, and coloring pages to print. Use our extra columns for easy navigation. No registration necessary. These printable worksheets can be used with any elementary education program or home school curriculum. If you have a bright third grade student, check our higher levels. 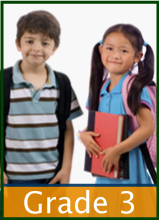 If you're helping a struggling third grade student, check our lower levels; especially our Phonics and Math worksheets. See our list of 3rd Grade worksheets below the different courses and their icon links. Thanks for patronizing our affiliates since they keep our site running. See our left nav for the different subjects and use our search bar to find topics of interest. Our printable third grade worksheets for Math are an extra help with the basic Math facts like multiplication, division and fractions which simply need introduction and then plenty of practice. Introduce the times tables and the concept of putting amounts together by sets to form products then the math symbols. By second grade most students are familiar with the basic Math facts. If not, reintroduce. Many still benefit by using Addition Worksheets and Subtraction Worksheets for practice; yet by third grade most students are learning or are interested in the “easy addition” of multiplication. 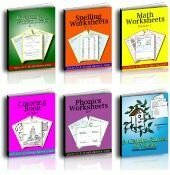 We have a complete year's worth of third grade spelling words worksheets that have room to practice the correct spelling of words three times each. There is also a reference sheet to match this list of spelling words. By the time that students are studying 3rd Grade Spelling words, they frequently have a grasp of the basics in Phonics. If not, be sure to visit our Phonics Worksheets page in the left column. Our list is from an old third grade reader so that we would publish a useful version to both faster and slower students. The main download has 106 pages including a six page printable Spelling list for reference. The six page reference list of spelling words is next to it for easy reference. I like to print this on card stock for my students so that it lasts through the year. 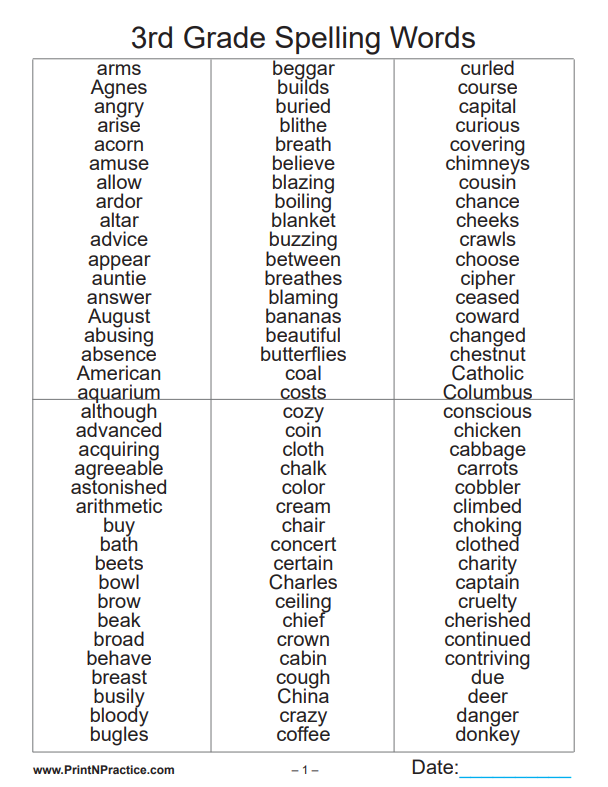 Rather than wait till a higher grade to learn endings, these worksheets show many words with the different endings so that your students have an opportunity to see how the word meanings change with different suffixes. It also shows some examples of different spelling rules. Isolated practice spelling lists like our 3rd Grade Spelling words can also be lists of vocabulary words. I find that when a student can spell and pronounce vocabulary words, write them correctly from dictation, use them in sentences of his own, distinguish the prefixes and suffixes with their meanings, and have the habit of using the dictionary with new words his reading comprehension will improve. How can one comprehend words that have no meaning? This is why studying Vocabulary words is so important. Any time that you recognize words that are from your students' Spelling lists, be sure to explain them. Also, if you look through your student’s reading activities for important words to understand and then offer those words as spelling words and vocabulary words. You can do this manually on our blank spelling worksheets with the line-ruling on our printable writing paper and columns that you choose. Also, encourage your student to keep his own notebook or binder of misspelled words for Spelling practice, Spelling rules, and definitions. Even a brief synonym, symbol, or picture can help students remember a word's spelling and definition. In this way the same notebook can be used for many years. I find that isolated spelling lists are more useful when a personal list of difficult spelling words is also kept for practice. If the student forms the habit of keeping a list of his own misspelled words from his essay writing, practicing the correct spelling and looking up the vocabulary words, he will know how to learn new words in any science or study. Use our practice printable Third Grade worksheets for spelling to help your kids form this habit and can be printed out to fill a binder with divided sections as for 3rd Grade Spelling words, etc. 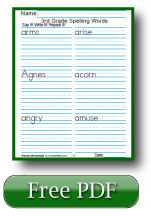 You can buy our K-6 spelling worksheets in one bundle with convenient files. This also includes our phonics spelling words. Thank you for visiting our third grade worksheets.